I’m at the Dell EMC World 2017 conference in Las Vegas this week, and I’ve been enjoying catching up on what the network group has been up to. In my previous experience, the legacy Dell Networking products have unfortunately been seen as those things that get thrown in when you buy a rack of servers . In other words, they lacked credibility or worse, the rack would come with another vendor’s switches in them, reinforcing the idea that Dell’s own products weren’t up to the job. It’s my belief though, that two things in recent years have dramatically changed that perspective. The first is Dell EMC’s OS10, a modular network operating system which by all accounts is actually pretty capable. Previous OS incarnations were of varying quality, as has been the case with many vendor-branded switches, and with the release of OS10, Dell Networks (as it was at the time) put a stake in the ground and showed that they wanted things to be different. The second element is disaggregation. Dell identified the opportunity to use what was becoming ubiquitous merchant silicon like the Broadcom Trident II chipset to be able to play at the exact same level as everybody else. Given that at its most basic, Computer + Trident II = managed switch, and given that Dell already made the computer part of this equation, it was well placed to produce network switches which could then be certified for use with other operating systems, neatly fitting into the (please forgive me) brite box (i.e. branded white box) network switch category in addition. Add in fabric capabilities, and Dell EMC has moved from being a network vendor whose equipment sits within server racks, and is now a player capable of providing the whole switching infrastructure for the data center or campus network. That’s quite a transition, and because of the Open Networking initiative, if Dell EMC’s OS10 is not the preferred choice of OS to run, perhaps Cumulus or Big Switch could be worthy alternatives. So, with that said, Dell EMC announced yesterday (Monday May 8, 2017) that they have a few new open network switches. In the context of my introduction above, here’s what coming soon. The Dell EMC S5100-ON series top of rack switches sport either 48 or 72 x 25Gbps Ethernet ports, with six multispeed (10/25/40/50/100)Gbps uplinks. Oh come on, you may be thinking, who uses 25Gbps ports? The answer is simple: Dell EMC does, on their latest (newly announced) 14th Gen (14G) PowerEdge servers. Look at that: synergy between the networking and server teams! As an Open Networking switch, it’s likely to be supported by Cumulus, BigSwitch and possibly Pluribus Networks as well. The Dell EMC S4100-ON series offers slightly more modest speeds than the S5100 series, offering up to 48 x 10Gbps ports with various combinations of 10/25/40/50/100Gbps uplink ports, but some models also support 8/16/32GBps Fibre Channel for SAN connectivity, and many of the switches are stackable should you wish to do so. 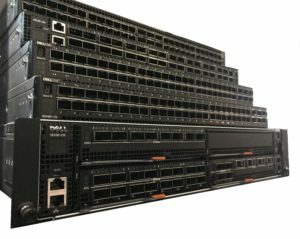 The Dell EMC N1100-ON series are campus switches ranging from an 8-port fanless half-width switch with 1 x 1Gbps SFP uplinks, up to a 48 x 1Gbps port switch, 24 of those with POE, with 4 x 10Gbps uplinks. All except the 8-port switch model are stackable, using the 10Gbps ports. These switches can be managed using the Aerohive Hive Manager NG, a cloud-based management portal originally designed to manage wireless networks (as implied by the name), but is now expanded to include wired networks too. It seemed odd to me that the Dell EMC vBlock / vxBlock and Dell EMC vxRack products come with Cisco switches, so I queried why this was so. In summary, vBlock and vxBlock are part of a long term partnership with Cisco, so will continue to come with Cisco switches. The vxRack product however will ultimately be available with three switch flavors, Dell EMC, Cisco or Arista. The logic seems to be that if a customer already has a Cisco network (for example) it’s likely that they would prefer to interface with more Cisco devices in the vxRack. Customers with other vendor infrastructures or green field installations on the other hand, are likely to be more flexible. And now we know. I am attending Dell EMC World 2017 as a guest of Dell EMC who provided my flights and accommodation for the event. That said, as ever, there is no quid pro quo, Clarice; I get to write what I want, if I want, how I want. I didn’t even get a backpack, so you can trust me I am not being swayed by a free laptop carrier with straps.